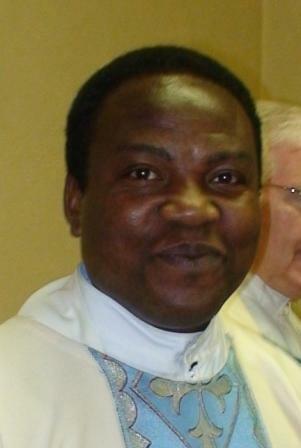 Fr Hope Klutsey SMA was born in Ghana in 1964. After completing his secondary education he entered the SMA Formation programme and was ordained a priest in 1998. Since then he has served in different African countries, including a period as Regional Superior for the SMA in Ghana. After completing Sabbatical Studies in Dublin, Ireland he was appointed to the SMA team in Zambia. Last 8 December he preached at the celebrations to mark the 154th Anniversary of the Foundation of the Society of African Missions. At present the Society is working in the Archdiocese of Lusaka, where we also have a Formation House and in the diocese of Ndola (the Copperbelt region of the country). 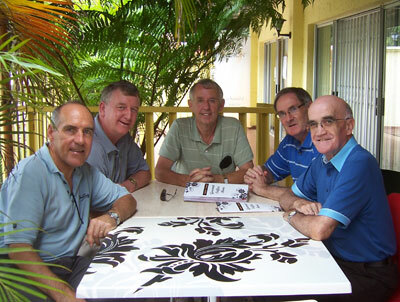 Our photo shows, from left, a group of Irish SMA priests at a meeting in 2010: Frs Anthony Kelly, Fachtna O’Driscoll (Provincial Leader who was visiting Zambia), Brian O’Kane, Tom Casey and Cathal McKenna. Today we are celebrating the Feast of the Immaculate Conception of the Blessed Virgin Mary and the dedication of the SMA to the same Blessed Virgin Mary at the Sanctuary of Fourvière in Lyons, France. Since everyone here knows the story of the SMA by heart, it is better to invite us to reflect on the Immaculate Conception and the risk Mary took. Some Catholics excluding the priests here present have hazy ideas about this feast. For that matter it is very important to be as clear as possible when giving reflection on this day. The first reading tells us what happened to Adam and Eve on account of their disobedience; it is a sad story, indeed. The second reading brings joyful news for us all; in his love, God has chosen us, right from the beginning of the world. But chosen for what? Chosen to become his children through sharing his own life, and to live holy lives so as to get ready to share God’s life, here on earth and later in heaven, and to take the Good News to the world. We all know that God created Adam and Eve out of love. They came out of God’s hands perfect in body and soul. God made them lords over all things created and so lovely was the place where he put them, that scripture calls it “a garden”. They were happy and could not imagine anything which they did not have. God made them his children by sharing with them his own life, as a mother shares her life with the child in her womb. In his letter to the Christians of Ephesus from which the 2nd reading of today has been taken, Paul calls this life by the name of “Grace”. This “grace” means “gift”, something no one has the right to, and something no one could expect. The perfect name for it would be “grace-life”. This is the life Paul often refers to in his writings by the name of “life in the Spirit”. God created Adam and Eve free, that is, left it to them to accept or reject the gift offered. It is incredible that they should have been so foolish to disobey God’s command and as a result lost the life in the Spirit. Despite their disobedience, God still finds a way to deliver humanity from perpetual condemnation. How would he do it? Through Jesus Christ, whom he would send into the world to become a man like us in everything, except sin. The purpose of God’s Son coming into the world would be to give back to humanity the “Grace-Life”, the “Life in the Spirit” which Adam and Eve had lost. Jesus, the Messiah, chose Mary, a village girl from Nazareth, to become his mother. None of us was given the opportunity to choose our mum. If we were given the chance, we would have chosen the best woman in the world. And this is what our Saviour has done. There is a proverb which says “Exchange is no robbery”. This exchange took place in the life of Jesus and Mary. Jesus gave Divine life to Mary and Mary gave human life to Jesus. But Mary however, was granted the Life in the Spirit in advance before she was born, before her Son was born, before he suffered, died and rose from the dead. This is the core of today’s celebration: “The Immaculate Conception”. The “yes” of Mary, which transformed the entire humanity. Her words of surrender are beautiful, revealing the true liberated spirit. – She is the hand made of the Lord (v. 38). Mary did not ask that God’s will be changed, but that it be done. That is the essence of holiness. We who now meditate this feast of Mary already know that everything was going to be all right. But at this point Mary did not know that. We may fail to marvel at the incredible courage and indomitable spirit of this young woman who, not knowing what the outcome might be, said “yes” to her God. That “yes” to God risked everything Mary had a right to hold dear; her family, her friends, her security, her respectability, in fact her life was at risk as well. “Qui ne risque rien, n’a jamais rien” says a French proverb. « No pain, no gain ». She was aware that her “yes” meant much pain, but also much trust. Her “yes” was no less of a risk than we Missionaries must take every day, when as SMA Missionaries, we too must take risk wherever we are. Mary took risk. Our Founder took risk. The early Missionaries in Africa and Zambia took risks, why can’t we take risk? If we risk nothing, then we risk everything. People who risk nothing do nothing, have nothing, and are nothing. “If someone feels that they had never made a mistake in their life, then it means they had never tried a new thing in their life, they took no risk.” – Albert Einstein. Such people may avoid suffering, ridicule and sorrow, but they cannot feel, grow, or love. Chained by their certitudes, they have forfeited their freedom. Only a person who takes risks is free. Mary was the first Christian to commit herself to Christ in the adventure of faith; it is fitting that God fill her with grace, the fruits of her Son’s redemption – because this simple girl had the courage to love her God and risk everything by trusting Him. Let us pray in this Eucharist that all SMA missionaries will take risk in order to bring the Word of God to the people they serve. Amen!